Many of the new people coming into the DSM arena come from other car enthusiast backgrounds (Honda, Toyota, and even domestic cars). The first thoughts are to apply the same techniques as they've done with other cars. The problem is, all cars are different and react differently to modifications. The first thing a newbie should do is to read up on how their car works and gain a better knowledge of the mechanics of automobiles in general. Most newbies come in and immediately want to know what the biggest turbo is that will fit on their car. You can not add a larger turbo to your system without adding several other parts first. If you do so without adding the appropriate modifications, like injectors, a tuning solution like ECMlink, exhaust upgrades, etc, you're risking blowing your engine. Look through the Resources section to find upgrade paths and suggested maintenance before you bolt on a big turbo. The second most common question is, "how do I make my BOV louder?". The long-time DSMers will cringe when we hear this question. The fact is, a louder BOV on these cars will usually conflict with vehicle performance unless you convert from a MAF setup to speed density. In order to make a BOV loud, you have to vent to the atmosphere (as opposed to back into the intake, like our cars do from the factory), releasing the excess air instead of routing it back into your turbo system. The problem with this, is that your ECU has already accounted for this "excess air" and adjusts fuel curves accordingly. If it's not in the system anymore, the ECU is compensating incorrectly. This means that the car will not run the way it's supposed to. It may idle poorly, stall on deceleration when the clutch pedal is pushed in, or it may not be noticeable at all - but it will have a negative effect, even if you can't feel it (the logger will prove it). In any event, if you search the tech articles for "speed density" you will find out how you can vent to the atmosphere without any negative effects. An unachievable goal for 95% of the DSM community. I love seeing people come in here and think they're going to run 10's and 11's. Sure, it's possible, but it is only done by those who have a lot of money to spend. If you have your car parked in the driveway and have $10k in your wallet and know what you're doing, you may have a chance. The truth is, it will require just as much technical knowledge of your car as it does money. Spending the money is the easy part. It's not the parts that make your car run 10's. It's the testing, tuning adjustments, repairs, new trannies, and driving practice that will get you there. 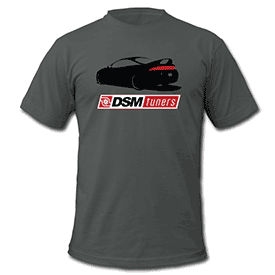 DSMs are very capable of running fast times, but like any other car, they require money and know-how to go fast. It is well known that raising the boost levels is the quickest and easiest way to raise your horsepower. It's also a quick way to mess things up and hit "fuel cut" (when the ECU cuts fuel at WOT when your boost is too high). If you raise your boost levels with a boost controller, be sure you've first installed an aftermarket boost gauge, and don't much higher than 14-15psi without upgrading injectors and fuel pump. 4a. Maintenance - some newbies try raising boost levels and installing parts without doing the proper maintenance on their 15-25 year old DSM. Rubber hoses dry out, timing belts need religious replacement, oil, gear lube, coolant, gaskets harden, brake fluid has a limited lifespan, and previous owners usually neglect all of this. If you don't know when they were changed last, change them. These cars are old enough to where most systems need to be rebuilt or refreshed. Do this before adding more power. Many people coming from the Honda world quickly start asking about which intakes and headers are available. This is because those mods have always been common in other import non-turbo applications. The intakes on turbocharged DSMs can be replaced, but aren't significant power-adders. Changing air filters is recommended early on. The factory 2g and Evo3 exhaust manifold is more than adequate for up to 500hp, with some porting work (except the 1G crack-prone manifolds, which should be replaced) though the FP cast exhaust manifold is really nice replacement. I's the rest of the exhaust system that needs attention, not the manifold. Tuning is something that, many of those entering the DSM community, may not be familiar with. Yet, it's the single most important aspect of building up a DSM to meet its potential. Tuning requires adjusting the fuel curves used by the ECU in order to maximize power output. The most popular solution has been ECMlink, a piggy back ECU system, though there are a few other DIY solutions that have caught on over the years. No matter what you choose, know what you're doing or pay someone who does. Getting this wrong will destroy your engine. Rarely do these really improve handling beyond making the ride stiffer, mostly because the rates are too low for the amount of lowering. Also, lower cars need shorter shocks (but people don't shell out for Konis, which are the shortest OTS shocks), while high-rate springs need more rebound damping and not more compression damping (which is why Tokicos and AGXs don't work well). Finally, lower does not automatically mean better handling, because you might now be hitting the bumpstops and you also might now have lateral control arms that angle upwards. 99% of tire-wear problems come from the toe-out that you get when you lower the car. The problem is not the extra negative camber. Yes, lots of negative camber hurts traction on a straight-ahead launch, but it helps in cornering. After lowering a car, you might need to remove some rear camber (or the understeer will be awful), but you don't need to take out any front camber unless it's a dedicated drag-racer or slammed to the ground (but see above). Mattjaye2198, Roy Eaton, godprayzer and 22 others like this.